Last week wasn’t a great one for my fantasy surprises, but it seemed like a tough week in general across the fantasy landscape. Hopefully this one is a little bit better. With six more teams on bye including players from some potent offenses, this has the makings of what could be a rough week for many fantasy players. The good news is that as mentioned last week, a season of fantasy isn’t determined in a single week. Heck, even when fantasy owners have fantastic matchups crazy things can happen and it’s a rough week. Here’s to a winning weekend for all playing. QB: Colin Kaepernick vs Saints: Would I feel confident playing Kaepernick in any fantasy formats? I wouldn’t be, but for someone who streams quarterbacks or that chases cheap options on daily fantasy he’s an intriguing option. He’s playing a reeling secondary in the Saints, and we know Kaepernick offers plenty of upside as a running threat. It’s a play that isn’t for the faint of heart, but could pay off in a big way. Expect around 240 total yards and two touchdowns. RB: Charcandrick West vs Jaguars: West spent some time as a fantasy darling last year, and finds his time to shine this week as well. With Jamaal Charles back on IR and Spencer Ware set to miss this week with a concussion, West has little competition for touches and a prime matchup. West can contribute in multiple ways and based on projected game flow should see twenty plus touches. There is a lot to like here. Expect around 90 total yards and a touchdown. WR: Corey Coleman vs Cowboys: Coming back from a broken hand, Coleman is going under the radar, but that shouldn’t be the case. Coleman is quite the talent and against a banged up Cowboys secondary could provide some excellent value for those who were patient. Start him as your third wideout or in the flex this week, and the payoff could be huge. Expect around 70 yards and a touchdown. 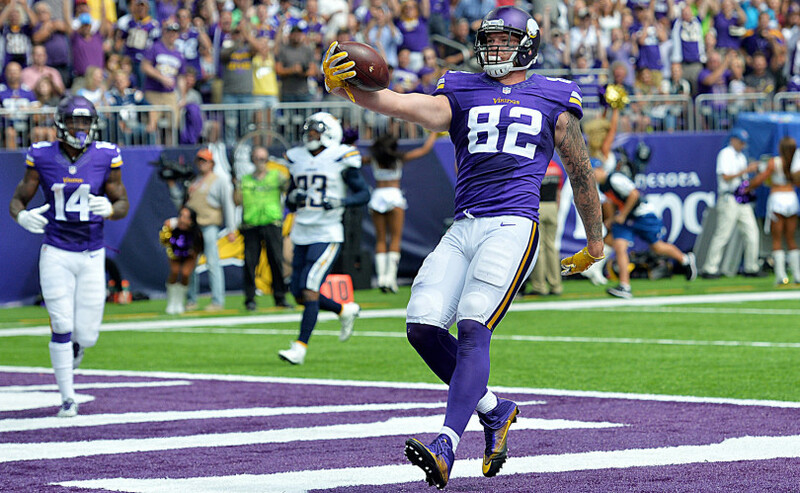 TE: Kyle Rudolph vs Lions: Due to injuries all across their offensive line, there a lot of reasons to be worried about the Vikings passing attack. Fortunately for Rudolph, the equally banged up Lions defense is not of those reasons. Did I mention they also struggle against opposing tight ends? In a week with options such as Rob Gronkowski and Jordan Reed on bye, Rudolph makes for a very nice replacement who could be available. Expect around 60 yards and a touchdown. K: Mason Crosby vs Colts: Due to the Packers’ offensive struggles, Crosby hasn’t had the opportunities one would think to this point. Fortunately for him, the Packers get another favorable matchup against the Colts defense. As a player who could be available in a good amount of leagues, Crosby represents a nice option this week. Expect around two field goals and three extra points. DEF: Dolphins vs Jets: This isn’t a great week for sleeper defenses, so the Dolphins will have to do here. While Brandon Marshall against the secondary does scare me, Ryan Fitzpatrick at quarterback does not. The Dolphins emphasis on the ground game should limit the amount their defense is on the field, so if they are able to generate pressure on Fitzpatrick, the points shouldn’t be far behind. Expect around three sacks, an interception and a fumble recovery. This entry was posted in fantasy football, NFL, sleepers and tagged 2016 week nine fantasy football predictions, Charcandrick West, Colin Kaepernick, Corey Coleman, daily fantasy football advice, Fantasy football, Kyle Rudolph, Mason Crosby, Miami Dolphins, NFL. Bookmark the permalink.